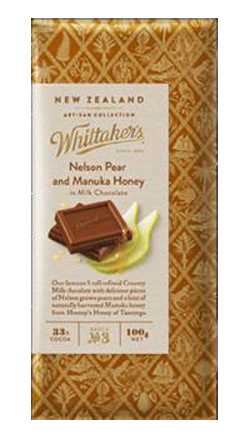 Whittaker's famous 5 Roll Refined Creamy Milk chocolate with delicious pieces of Nelson grown pears and a hint of naturally harvested Manuka honey from Mossop's Honey of Tauranga. Milk Chocolate (90%): Sugar, Cocoa Mass, Cocoa Butter, Milk Powder, Emulsifier (Soy Lecithin), Vanilla Flavour, Natural Pear Flavour. Pear and Honey Pieces (10%): Pear Puree (33%), Concentrated Apple Puree, Invert Sugar, Sugar, Humectant (Glycerol), Manuka Honey (2.5%), Wheat Fibre, Gelling Agent (Pectin), Natural Honey Flavour, Acidity Regulator (Citric Acid). Milk Chocolate contains Cocoa Soilds 33%, Milk Solids 30%. the pear pieces are absolutely to die for along with the subtle manuka honey flavour. I think that this has to be the best ever chocolate from Whittakers and that's saying something as they make the worlds greatest chocolate. This is absolutely delicious with a lovely flavour of pear thanks to tiny slightly chewy bits of pear and a very subtle taste of manuka honey. Totally unlike anything else I have tasted in a chocolate bar before. Whittakers you have surpassed yourself. Anyone who hasn't tried this you have to as it is incredible.